Do we need to teach the Pythagoras Theorem? 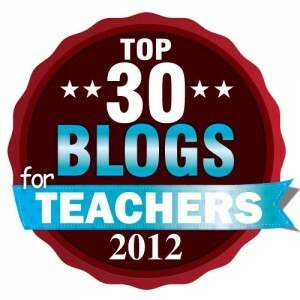 On David Wee’s blog, 21st Century Educator, he recently reflected on whether we need to teach the Pythagoras Theorem. He argued that while there is good reason to teach an abstract idea, in most real life circumstances, we would just measure the missing side of a triangle if we needed to. He then went on to ask a few questions such as: Why do we teach the Pythagoaras Theorem? Why is it so important? 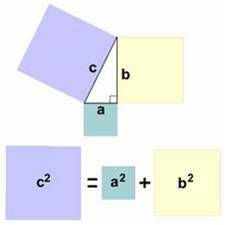 Could you imagine a curriculum without the Pythagoras Theorem? If you add the areas of the squares that lie on the shorter two sides of a right angled triangle then you have the area of the square that lies on the longest side. You may have been taught the formula differently at school but that is simply a case of how the sides were labelled at the time you were taught it. The letters a,b and c are commonly used but x, y and z would do the same job just as well. A famous set of numbers which this works for is the 3 by 4 by 5 triangle (also known formally as a Pythagorean Triple). 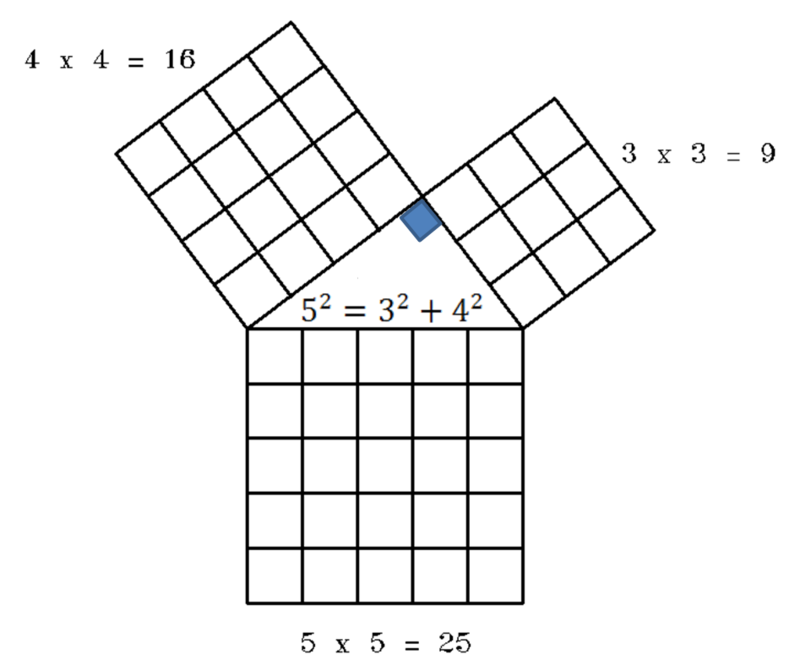 This means that the area of a square with length 3 units plus the area of a square with length 4 units is equal to the area of a square with length 5 units. An interesting point about the pythagoras theorem is that you could actually choose any shape to lie on the lengths of the triangle – it does NOT have to be a square (See my Geogebra Applet showing hexagons and pentagons). Alex Bellos notes in his fabulous book, “Alex´s Adventures in Numberland, ” that we could even use a mona lisa if we wanted to. Maybe at this point you´re starting to see that pythagoras is just as much about area as it is about length, if not more so! Now that I’ve given you a quick recap, let’s get onto David Wee’s post. Firstly, I think it’s a great post because it immediately made me defensive of a theorem which is so elegant and simple and used in such a variety of different contexts other than finding a missing length of a right angled triangle. To be fair though, even if it was used for this purpose only, the history of the theorem is interesting in itself. There are so many mysterious questions surrounding its history. For example, who knew about the theorem before Pythagoras? Did Pythagoras himself make it into a theorem by proving it or did someone else? Did he steal the idea from the Egyptians? Did someone actually die for divulging information about irrational length diagonals of triangles? Was Pythagoras a group of mathematians? Did Pythagoras even exist? There are also some intriguing things about the theorems more recent history. I wonder how many distinct proofs there are of the Pythagoras theorem now? There must be more than one hundred??? I love the fact that James Garfield, the 20th US President, made up his own proof of the Pythagoras Theorem (See Math and Multimedia blog post). It’s not just the fact that there are so many proofs but I personally think that one of the pictoral proofs is a proof that students find simple and enlightening. Put simply, we first arrange 4 right angled triangles inside a square. Each triangle is exactly the same size and, in this case, the shorter sides are labelled a and b with the longest side labelled c. In the first picture you can see that the space left over is filled up with a square of area a squared and another square with area b squared. 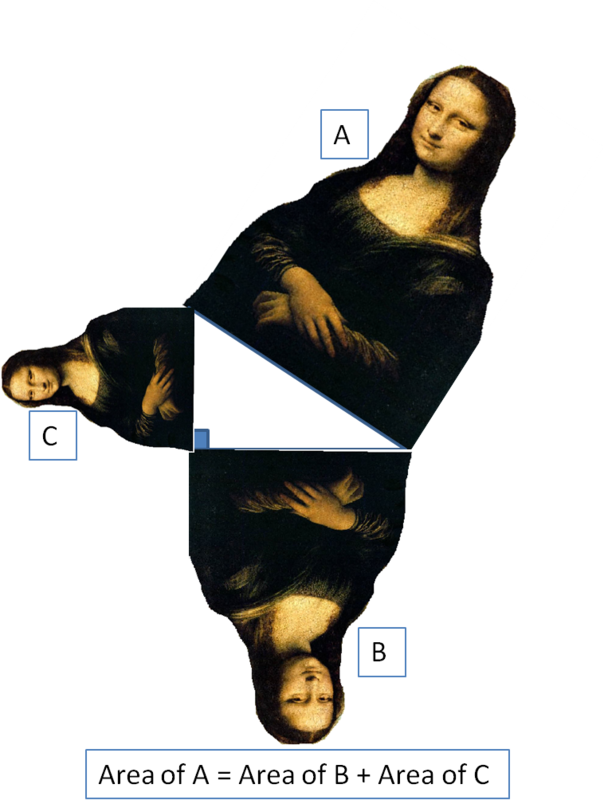 If we rearrange those triangles inside that square, then we´re left we a square of area c squared in the second picture. No matter what the dimensions the triangles have, we could always do the rearrangement in this way which is why it is a proof for any triangle. Of course we still have to prove that the area left over in the second diagram is actually a square but that is pretty simple and just a minor point when we consider the concept as a whole. I also love the fact that the theorem itself is so simple and elegant, which is probably the reason why so many adults still remember it from their own school education. The only other plausible explanation I can think of for why it’s so well remembered is that the scarecrow popularized the theorem by mis-stating it in the 1939 version of the film, “The Wizard of Oz.” But I´m pretty sure it´s the first reason. Whilst this is all interesting and fun to think about, it doesn’t answer the original question of why we need it when we could simply measure the missing length of a triangle. I’m sure there are many, many reasons for this which I’ve never considered. I do however have many reasons of my own, and all of these reasons are the things that immediately came into my head while I was reading David’s post. Furthermore, I can write them down in the same order that they came to me. 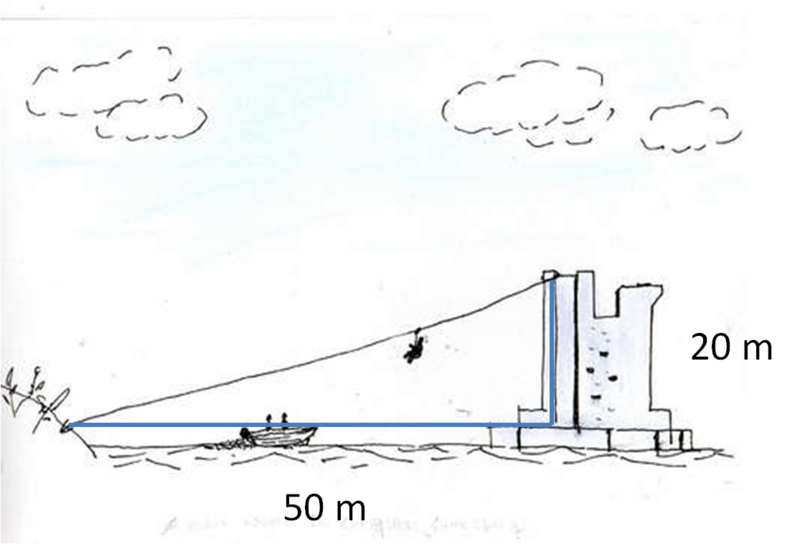 1) If I was doing something practical, like designing and constructing a zip line in a park, then I would personally measure the horizontal distance of the zip line and the maximum height at the start using a tape measure. I could then use Pythagoras to figure out how much zip line I would need to buy. Now there are of course assumptions that I am making here such as the ground being perfectly horizontal, but I can certainly imagine a case in which I would do this. In a similar way, I might use pythagoras to find the length of a ladder I was making for a tree house. 3) Students get to physically see an irrational length using pythaoras and can also construct irrational lengths for themselves. 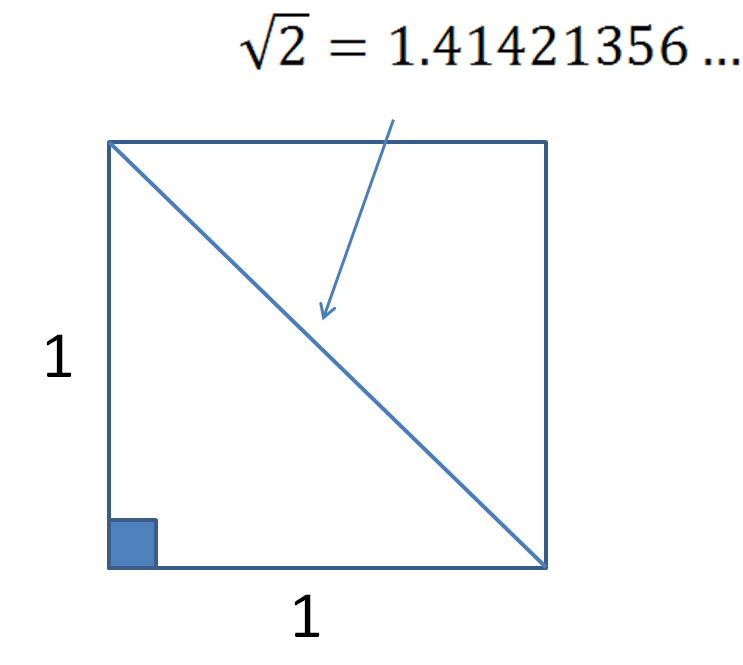 Draw a square with side length 1 unit and you know by pythagoras that the length of the diagonal will be the square root of 2. Indeed, it’s empowering to know the exact length of a side which is something we certainly couldn’t do by physically measuring it. An extension of this is when you show a surd equality using Pythagoras, such as why the square root of 8 is equal to root 2 plus root 2 (See one of my previous posts on the Geometric Representation of Surds). 4) You can use pythagoras when you are not physically there to measure something. If you check out a post I wrote last week, I described a year 9 project which involved finding the amount of glass we would need to construct the Louvre Pyramid in Paris. The glass panes on the Louvre are a combination of equilateral triangles and rhombi. Information given on websites only gives the dimensions of the Louvre, and so the students had to count how many panes spanned the base of the pyramid which allowed them to find the length of one side of a pane. Knowing that, many of them used pythagoras to find the perpendicular height of the triangle to then go on to find the area of the glass pane. 5) On a personal note, after recently discovering Don Stewart’s blog, Median, I’ve been checking out some of the tasks that he’s posted to see if I could use them with some of my classes. I’ve used the Pythagoras Theorem three times in the past week to solve one problem and prove two other theorems (See one of the Theorems here). a) Deriving the cosine rule to find a missing length or angle on any triangle. Indeed Pythagoras is just a special case of the cosine rule when the triangle is right angled. 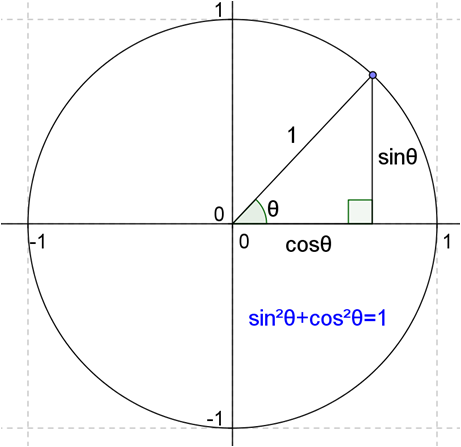 b) Deriving the general equation of a circle and deriving trigonometric identities from the unit circle. c) Working out kinetic energies of objects. If an object is moving at 5m/s, it has the same amount of kinetic energy as it has when it is moving at 4/s and 3m/s combined. d) Come to think of it, whilst my Special Relativity is extremely rusty 7 years after studying it, you also use it to derive the contraction formulae for time, mass and length of an object. 6) I remember reading this interesting blog post on BetterExplained a while ago about Pythagoras. Follow the link for even more examples of the uses of Pythagoras. These are the things I can think of from the top of my head and this is jut a drop in the ocean of things that you can use it for. So that’s all that went through my mind when I read David’s post. I guess then that David is right in a way. In my zip line example, I could just buy a load of zip line, attach it to both ends and then get rid of the line that´s left over. However, I think the great thing about pythagoras is that it provides us with more knowledge and power than we would have had without it. This applies to most of mathematics in general. When asked about what mathematics adults remember from school, a common answer is the Pythagoras Theorem. Now whether they actually remember the exact details is not important, not even the film makers from the Wizard of Oz remembered it properly! (unless they meant for the scarecrow to state it improperly). But there is obviously something magical and amazing about this simple, elegant and extremely useful theorem which has contributed to so many areas of mathematics. Dr.Wiggins actually challenged students to generalise the Pythagorean Theorem to other shapes. The outcome looks great! This entry was posted in Shape and Measures and tagged Pythagoras Theorem. Bookmark the permalink. 3 Responses to Do we need to teach the Pythagoras Theorem?